Back in 2014, I wrote a post called "Beg Borrow, and Steal: 7 Great Ideas from Other Blogs." Since then, I've gathered quite a few more great ideas from other teachers, so I thought I'd create a sequel post. Here are seven more ideas from other teachers that I have used in my classroom. I previously blogged about this activity in my list of favorite new activities I tried in 2014 and my Food & Meal Taking Activities Round-Up. 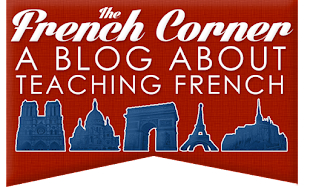 This is an idea from Steve Smith of Frenchteacher.net. He proposed having a game show à la The Price is Right, having students guess the price of various items. My students absolutely love this activity. 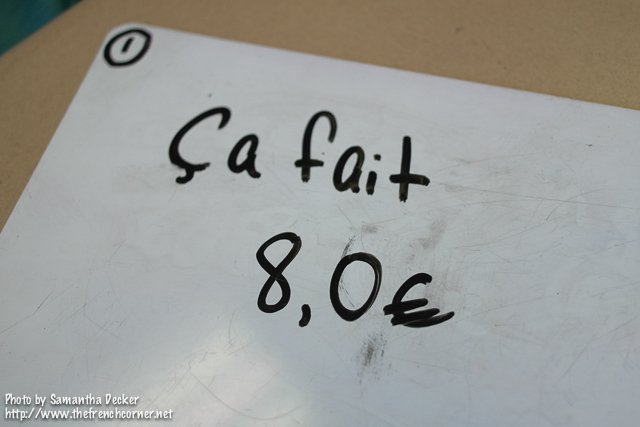 They work in groups to guess the price of various items I have on the SMART Board, but they have to negotiate entirely in French. They also have to write their answer in a complete sentence, reinforcing the difference between il coûte, elle coûte, and ça fait. I have had several students say to me at the end "J'aime l'activité !" The Creative Language Class had a wonderful post on cognate practice, in which the author, Megan Smith, describes an activity for the first week of school in which each student gets a target language piece of literature. 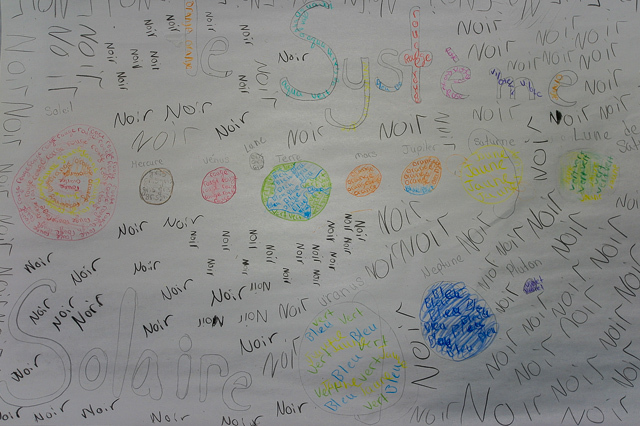 They then write all the words they recognize (cognates) on post it notes and make a word wall. For the past couple years, I have shown my students this infographic and had students hunt for cognates. 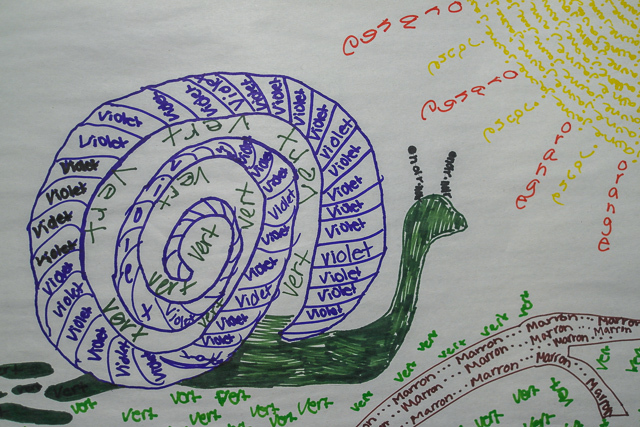 Between the numbers, visuals, and cognates, students actually understand more of this than they don't. It's a great way to build confidence in those all-important first few days. A teacher at the NYSAFLT Conference I attended in the fall suggested using sidewalk chalk as a fun way to practice language and get kids outside. In November, I had my French Club students draw flags from francophone countries on the pavement outside the entrance of the school to promote National French Week. The students enjoyed it so much, I'm thinking this might become an annual tradition! Stephanie Bass of Bonne idée! shared the wonderful idea to use the native clock app on the iPad to reinforce time (click here to read her presentation on using smart phones and iPads in the FSL classroom). 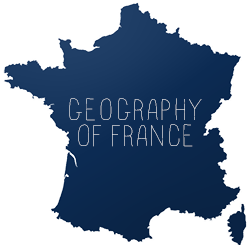 I took this idea and had my students complete a Socrative quiz about time in different francophone cities. Read my blog post on Practicing Time, Day, and Date to learn more about this activity and others. At a NYSAFLT Conference a few years ago, I had the pleasure of attending a workshop by Long Island teachers Valerie Greer and Wendy Mercado (check out their website). They had a lot of great ideas for hands on activities to use with middle school students. One such activity was Vitesse, or Speed. Students work in pairs. You give the pairs a series of photos or vocabulary words written on cards. The teacher calls out a word and the first student to tap the corresponding card gets to keep it. At the end, the student with the most cards of the two wins. I have done this with numbers (I call out a number in French, and the students tap the correct numeral) and food and drink. For the food and drink, I show a series of food and beverages on the SMART Board in various colors with price tags attached. I then announce things in French such as "I am thirsty and I would like something purple" (there is only one purple beverage, and the student would have to tap the correct word in French), or "I am hungry and I would like something that costs 2,50 Euros" (there is only one food item that costs 2,50 Euros, and again, the students have to tap the right word in French). This way, I am reviewing vocabulary, prices and even colors. Liz's Lessons has a great Pinterest Board featuring student work. 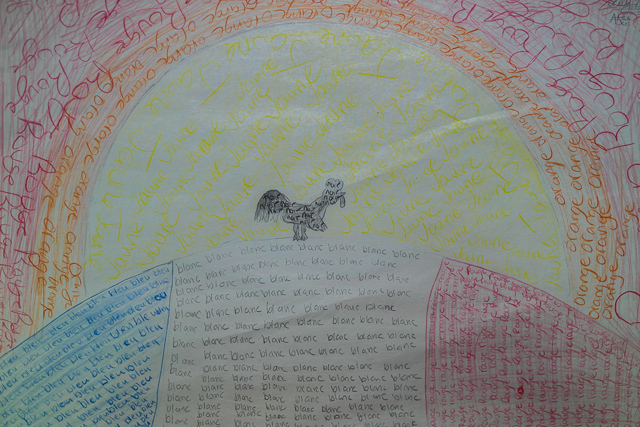 On it, she shared a drawing that a student made by writing the words of the colors they were using repeatedly. I have my students complete this activity in groups, but you could also make this a homework assignment. I really enjoyed this post as it is filled with many different ideas for activities! Not only did you share the activity, but also the original blog, so we can go read the rational and step-by-step directions! These activities seem like a lot of fun, and as we now, having fun and engaging activities is so important, especially in second language classes! I believe many of these activities could be used for different age groups and I liked how different they all were: some used art, others technology, others reading and writing, but they all used French.